South West Voice - Could some of these trends be barking up the wrong tree? What do you have when you’re in a first world nation? You have first world problems, that’s what. But it’s not just worrying about traffic jams or having too much choice when standing in front of the shampoo display at Woolies or Coles. Being first world also means first world trends, going where no human has been before and who knows where it will all end up. Getting a little tip off from one of our readers of a new place where you can pamper your doggie got me thinking that when it comes to what will be trending in the next few years may well be way out there, man. 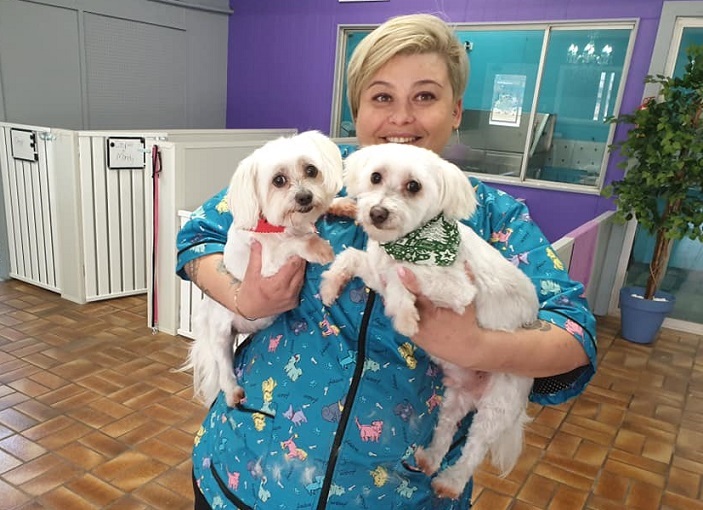 Pampered pets: Tepra at her Barkingham Palace Dog Grooming in Holylea Road, Leumeah with a couple of happy “customers’’. And a little bit all over the place as you will see from our Top 5 list of what sort of things will be really important for we humans in the next few years. Number 1. No doubt about it, the next big wave will be all about pampering our pets, dogs mostly, but cats, too, and maybe even the exotic animals some people keep at home. Of course pet insurance is also now part of the mix and that will also be on the increase. Number 2. Space travel is not too far away, apparently, so holidays to outer space for the whole family are bound to become reality before too long. Number 3. Our crystal ball sees an exponential increase in cooking shows on TV, sorry. It seems the fatter we get the more great dishes we want to see being prepared by Jamie and Nigella. Number 4. We will also be going fitness crazy, with boot camps and personal trainers giving the national economy a big boost all by themselves. But we will still be fat. Number 5. Music festivals will in future be run by governments to make sure any drugs handed out are safe. Well, they will have to provide drugs otherwise who will go to them?